The dual spray swivel aerator lets you direct the water flow where it's needed for washing and rinsing faster and more conveniently. Pull down on the aerator head for wide full force multiple steam spray and slide it up for a splash-free aerated stream. This aerator is ideal for kitchens. 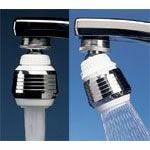 The maximum flow rate is 2.2 gallons per minute, and the aerator has a plastic body with solid brass chrome plated dual threads to fit most faucets with outside threads as well as those with inside threads.